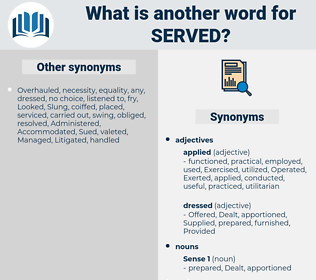 What is another word for Served? observed, responsive, represented, Strove, Oversaw, proved, conducive, address, presented, saved, moved, received, Beneficiaries, Testified, Sentenced, demonstrated, Contributed, objective, respond, Responded, Responding, drove, Presided, saw, Behaved, constituted, assistance, correspond, Corresponded, improved, facilitated, restored, Evolved, Benefited, Administered, sent, emphasise, emphasised, Catered, inspired, endeavoured, collaborated, Issued, guaranteed, Prevailed, permission, expressed, Discriminated, Seemed, selected, sat, practised, paved, fostered, Achieved, revealed, Favoured, job, Exercised, encouraged, posed, involved, Resulted, set, reassured, in-service, Furthered, Offered, ruled, Appeared, reported, released, seat, Lived, empowered, Wrestled, Suffered, transmitted, Transferred, circulated, Struggled, accomplished, Delivered, stress, stressed, emphasized, discharge, discharges, provide, Provided, Assessed, reflected, dominated, pursued, ensured, Promoted, Was, Were, shared, Enabled, Perished, promulgated, informed, Envisaged, Prosecuted, Had, Succeeded, enlisted, performing, Performed, described, advanced, laboured, satisfied, treated, ascertained, working, works, opposed, honour, honoured, supported, positioned, enhanced, assumed, increased, Remained, filled, duty, asserted, assure, considered, Indicated, Answered, Belonged, pointed, prepared, Forwarded, Consisted, processed, fulfil, fulfilled, verified, Prevented, Worked, greet, Greeted, shouldered, shoulders, Managed, Gave, accompanied, assured, Transported, Generated, already, reply, Replied, fed, Convened, spearheaded, arranged, highlighted, bore, Bears, experienced, Influenced, seized, consignee, dispensed, permit, permitted, utilized, attended, Caught, Relied, Incited, Examined, Cooperated, sustained, mandate, mandates, mandated, Stipulated, raised, Became, exert, signified, licensed, published, allocation, Rendered, insured, monitored, terminated, Enjoyed, summer, co-chaired, featured, adhere, Adhered, reacted, Poured, established, rushed, Embraced, ended, Enumerated, Encountered, Deployed, nominated, nursed, developed, Created, assembled, conveyed, ranked, Instituted, directed, engaged, led, retained, Emerged, enrolled, Earmarked, occupied, occupy, Occupying, struck, completed, Wrote, handled, Carried, practiced, Wished, allocated, Insisted, signalled, Captured, co-operated, identified, ignored, executed, finalized, authorized, opened, underlined, accepted, appointed, portion, deepened, brokered, conduct, conducted, Supplied, Awarded, Proceeded, aim, Aimed, moderated, realized, part, Incurred, earned, conferred, Entered, Mentioned, Competed, Tackled, equipped, Submitted, learned, functioned, functions, Brought, welcomed, dedicated, Stood, Caused, Combated, committed, produced, Flew, Reached, Passed, extended, branch, Undertook, effected, finished, granted, assigned, maintained, spent, Followed, Introduced, initiated, HIT, faced, showed, determined, concluded, Acceded, Occurred, Fought, play, played, abided, formed, station, Stations, Yielded, attempted, Chaired, licence, Lasted, Told, impacted, continued, held, defeated, marked, Allowed, aided, Stayed, fell, host, hosted, uprooted, Upheld, Died, fired, Cared, Underwent, included, combined, lent, partnered, Filed, Dealt, joined, laid, donated, Sailed, heard, cast, focused, Came, Met, Killed, felt, goal, read, Heeded, Knew, drew, run, Ran, Looked, shot, Approached, to, built, Gained, declared, handed, tabled, Acted, paid, turned, busy, office, Happened, Obtained, admitted, Notified, touched, Accounted, Launched, added, found, Walked, Picked, applied, tried, headed, place, placed, attached, Lobbied, team, Meant, let, he, figured, Marched, stated, wanted, beat, Claimed, kept, won, gone, Went, Bought, Amounted, Took, pulled, put, party, dated, 'd, unit, 'il, Did, Got, made. 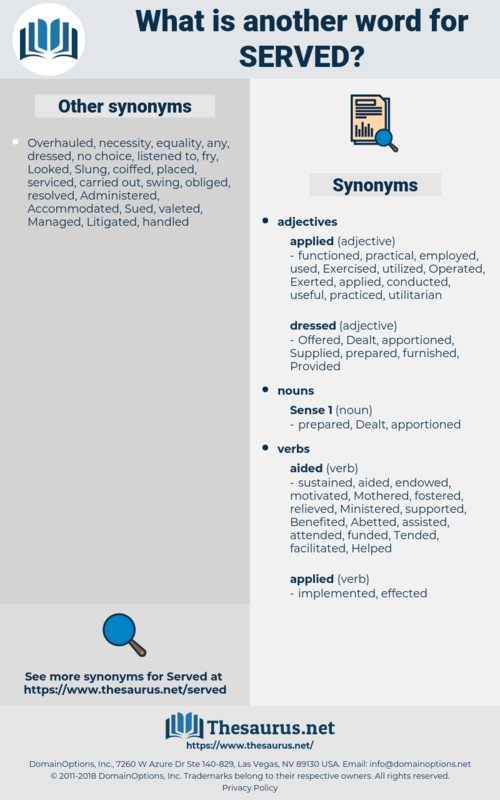 observed, conserved, represented, resolved, Strived, Striven, Overseen, imprisonment, proven, proved, Participated, presented, saved, moved, received, Sentenced, contributes, demonstrated, seen, Contributed, Retrieved, Accommodated, driven, Forgiven, Responded, Presided, strengthened, interested, constituted, governed, benefitted, advised, improved, facilitated, restored, Comprised, Benefited, advantaged, adviser, Administered, Arrived, sent, supervised, Catered, secured, inspired, risen, endeavoured, advisor, Helped, Issued, possessed, preoccupied, guaranteed, Resisted, expressed, nourished, Provisioned, selected, stimulated, sat, resettled, derived, mainstreamed, practised, paved, fostered, Achieved, revealed, Favoured, distributed, motivated, Exercised, entrusted, composed, encouraged, leveraged, posed, involved, Resulted, set, reassured, frustrated, imprisoned, Advocated, Furthered, Offered, ruled, Appeared, seated, Harvested, stricken, interconnected, reported, reporting, released, vested, safeguarded, seat, surrendered, Disbursed, discovered, conviction, Lived, empowered, Incarcerated, Perpetrated, harnessed, Enshrined, Suffered, transmitted, utilised, Transferred, restricted, endorsed, circulated, discharged, favored, accomplished, Delivered, afflicted, settled, absorbed, Provided, Assessed, expired, reflected, structured, Translated, pursued, ensured, Disseminated, Promoted, organised, exposed, shared, Enabled, prison, promulgated, informed, Hanged, constrained, destined, Prosecuted, have, Had, Has, indisposed, realised, subsumed, Succeeded, consumed, Performed, enforceable, described, advanced, evacuated, organized, Been, traveled, travelled, encumbered, retired, laboured, recovered, satisfied, Attributed, treated, ascertained, opposed, Reaped, honoured, supported, positioned, understood, affiliated, enhanced, assumed, increased, embodied, Remained, filled, protected, recourse, violated, asserted, considered, Indicated, Materialized, Answered, pointed, prepared, Forwarded, gratified, Consisted, processed, given, integrated, demobilized, Visited, fulfilled, Constructed, verified, Prevented, redeployed, Worked, associated, Greeted, shouldered, Propelled, Managed, implicated, broadcast, exploited, detention, ordered, assured, Transported, Underpinned, Generated, Energized, Eliminated, incorporated, worn, relevance, vented, Replied, pleased, elapsed, fed, Convened, arranged, highlighted, lost, Herself, experienced, Influenced, Purged, seized, penalty, commissioned, exhausted, dispensed, posted, Exerted, Confronted, permitted, convinced, Endured, utilized, Communicated, attended, pursuant, Caught, Relied, Cooperated, sustained, raised, recorded, signified, Borne, pronounced, licensed, become, published, outlined, Rendered, insured, estimated, Wielded, imposed, monitored, terminated, Enjoyed, Ascribed, Remitted, Invoked, breached, co-chaired, featured, populated, furnished, Adhered, reacted, spoken, Attracted, established, rushed, Embraced, ended, Installed, Enumerated, Encountered, educated, witnessed, Deployed, Displayed, employed, charged, developed, Created, enforced, assembled, issuance, Argued, dispatched, Instituted, directed, Defended, access, engaged, entitled, led, Challenged, retained, calgary, disclosed, Emerged, Earmarked, occupied, routed, connected, non-compliance, mentored, struck, compliant, Returned, disposed, Conformed, confined, completed, offset, handled, depleted, Complied, Pushed, Carried, practiced, Contemplated, allocated, election, signalled, Afforded, Captured, devoted, identified, executed, Discussed, finalized, authorized, participants, opened, guided, Consulted, taught, accepted, postponed, appointed, designed, conducted, Supplied, Awarded, formulated, Aimed, contained, realized, specified, pledged, Incurred, earned, Entered, Compiled, Mentioned, Tackled, actioned, suspected, Flown, equipped, Submitted, financed, learned, functioned, Brought, welcomed, dedicated, Stood, respected, Caused, Undertaken, Combated, committed, produced, detected, Sued, Availed, prohibited, Reached, Passed, extended, Championed, Shown, accrued, effected, finished, granted, Subjected, countered, assigned, damaged, eat, suited, maintained, spent, Accorded, Followed, Introduced, EXT, initiated, HIT, abide, missed, faced, showed, determined, Begun, Undergone, powered, concluded, grown, stay, Occurred, Fought, played, convicted, Detained, Exceeded, abided, formed, Yielded, Stationed, attempted, Chaired, licence, licenced, Told, endowed, impacted, Asked, continued, held, defeated, owned, marked, implied, Allowed, Rated, aided, Stayed, related, mission, hosted, trained, staffed, Upheld, Died, stocked, fired, controlled, forbidden, Cared, come, included, combined, fit, Fitted, lent, Filed, fueled, fuelled, fallen, united, Battled, Dealt, joined, laid, needed, Borrowed, donated, framed, attained, heard, located, expended, cast, focused, plaid, Met, Killed, known, withheld, drawn, felt, neglected, noted, Heeded, Shifted, defined, Lodged, run, matched, Looked, Debated, Enacted, failed, bound, shot, Approached, tapped, needless, tied, decided, built, Watched, Gained, handed, tabled, act, Acted, mailed, tracked, crowded, paid, turned, limited, office, Happened, Obtained, admitted, Loaned, Notified, touched, called, Accounted, Launched, closed, Waged, added, found, applied, headed, lifted, said, placed, Shipped, loaded, attached, funded, shed, backed, taken, Meant, aged, let, linked, Policed, Flanked, figured, beaten, Talked, stated, mined, coupled, Claimed, kept, won, based, gone, Amounted, packed, put, party, dated, Gotten, Got, done, made. servicing, Participated, participates, secured, help, Helped, useful, implemented, post, posted, member, Complied, needed, serviced. preserved, servicing, useful, assist, assisted, implemented, member, serviced. And meantime she was served out, wasn't she? Goodness knows I was grateful enough myself for the tears when they did come, and I got an idea from that experience that has served me all the years since.